US Doubles The Number Of Marines In Norway: No Big Deal Or Serious Threat To Russia? The United States has confirmed plans to more double the number of troops based in Norway, a move Russia has already criticised as “clearly unfriendly”. As The Local reports, the Norwegian Defence Ministry on Wednesday said that the US had recently informed them that they would push forward with a plan to increase the number of US marines stationed in Norway from 300 to “up to 700”. “US authorities have recently confirmed that they are happy to continue and increase the rotation-based training and practice in Norway for units from the US Navy Corps,” Norwegian Defence Minister Frank Bakke-Jensen said in a press release. The marines, the first foreign troops stationed in Norway since World War Two, were originally expected to leave Norway at the end of this year, but the posting will now last for up to five years. The Russians are not happy, as the embassy to Norway exclaimed that the stationing of US troops "contravenes the Norwegian decision from 1949." But, as The Local notes, Norway's foreign minister Ine Eriksen Søreide dismissed these claims, repeating the Norwegian government position that the marines should not be seen as a permanent US military base. "The Russians are very well aware of what it is and what it isn't," she told Marine Corps Times in May. "Of course, they are using it in their propaganda and we are countering that as best we can because this is something that is not new." The arrangement has also met with criticism in Norway from both the Social left and Labour parties, who argue that the priority should be maintaining a strong Norwegian troop presence near the northern border with Russia, but,as Arkady Savitsky writes, for The Strategic Culture Foundation, the transformation of Norway into the tip of the knife for an attack on Russia is taking place amidst the speedy militarization of other Scandinavian countries, the Baltic states, and Poland. Norway has abandoned its traditional policy of “no foreign forces on our national soil.” On Aug. 15, the Norwegian defense ministry reported that the US will more than double (from 330 to more than 700) the number of Marines stationed in that country, in line with plans first outlined in June. The deployments to Norway are expected to last at least five years, compared with the former posting that ran for six months after the initial contingent arrived in 2017 and was then extended last June. A new military base at Setermoen will accommodate the US personnel this fall. The United States has expressed interest in building infrastructure to host up to four US fighter jets at a base 65 kilometers south of Oslo, as part of the European Reassurance Initiative (ERI). The reinforcement comes ahead of a large-scale exercise dubbed Trident Juncture 18 — the biggest NATO maneuver in decades, involving 40,000 soldiers, 130 aircraft, and 70 vessels from more than 30 nations. That training event will be held from October to November in central and eastern Norway, the North Atlantic, and the Baltic Sea. Iceland, Sweden, and Finland will also take part. According to the Norwegian government, the sole purpose of the American military presence is for training, there is no escalation involved in this whatsoever, and Russia has nothing to worry about. Foreign Minister Ine Eriksen Soereide previously told reporters that this decision did not constitute the establishment of a permanent US base in Norway and was not targeted at Russia. Moscow issued a warning about the consequences such a move will entail. Are Russia’s concerns justified? After all, 700 soldiers are not a big deal for such a large country. They’ll finish their training, pick up some skiing skills, and leave. Is there really anything to worry about? Perhaps a more in-depth examination can provide an answer to this question. The US Marines Corps is a service designed mainly for offensive operations. They are training to fight Russia under certain weather conditions. Once it has begun, such training becomes a routine part of the operational cycle. Whether you call it rotational or permanent, they’ll be there for years, ready to attack. It’s not just a few hundred servicemen, it’s an expeditionary force. They are in Norway to make sure that everything is in place to ensure a rapid reinforcement in order to launch offensive operations that include air support right upon arrival. The cooperation between the US and Norway includes the exchange of intelligence, the purchase of weapons — including 52 F-35 aircraft and five Boeing P-8 Poseidon maritime patrol aircraft (MPA) — the use of Norwegian air bases, and the storage of military equipment in line with the Marine Corps Prepositioning Program-Norway (MCPP-N), which has been in effect since 2005. Actually, that project is a revival of a Cold War program that was launched in 1981 to preposition military equipment. Norway pays half of the program costs. Since 2014, it has been adjusted to meet the needs of the US Marine Corps. Their stockpiles have enough gear, vehicles, and ammunition to equip a force of more than 4,600 troops. According to the plans, there should be enough equipment and ammunition stored up to sustain a Marine Expeditionary Brigade (MEB) during combat. A MAB can consist of 8,000 to 16,000 Marines, or even more. And it’s not just Norway. 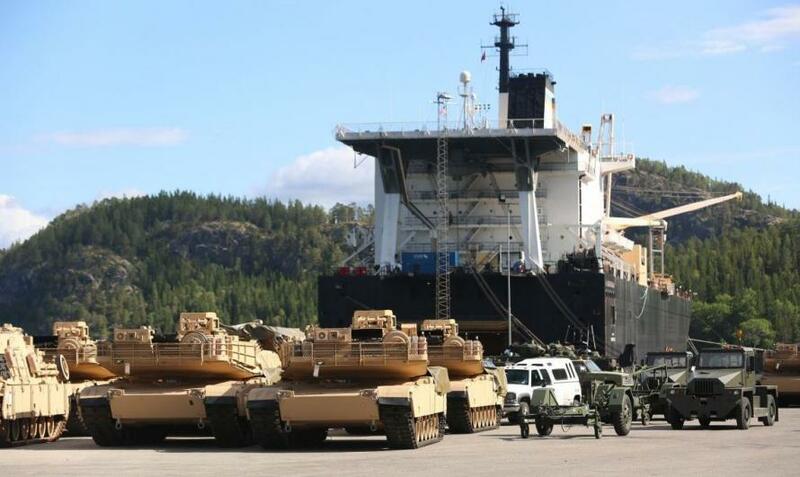 In May, US Marines from the 4th Tank Battalion withdrew tanks and weapons from storage caves in Norway to bring them to Finland during the Arrow 18 training exercise. That equipment was used in their maneuvers alongside the Finnish army. 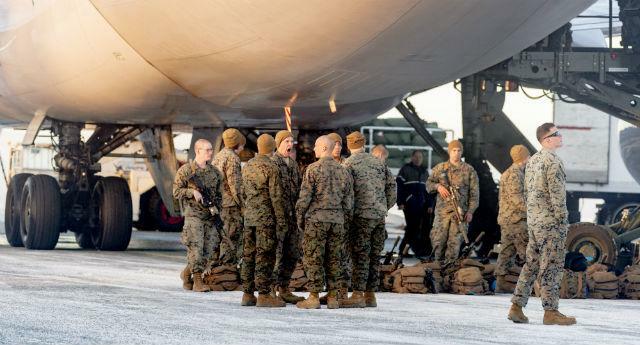 The US Marines in Norway could also be transported to Sweden. Such a scenario played out during the Swedish Aurora 17 exercise. As one can see, the Marines’ deployment in Norway is essential for providing US forces access from northern Scandinavia to the Baltic theater of operations. Norway is part of an intelligence and missile-defense effort. The high-powered radar Globus 3 in Vardo is an example. The radar in Svalbard (above the Arctic Circle) is installed in violation of a 1925 treaty, which states that Svalbard has a demilitarized status. It can be used for missile-defense purposes. The US Poseidon MPA from Andøya monitor Russian submarine movements. In June, the US, UK, and Norway agreed to create a trilateral coalition on the basis of those planes that will conduct joint operations in the North Atlantic near Russia’s Northern Fleet naval bases. The F-35 Lightnings purchased from the US are to be based in Ørland in southern Norway. They are nuclear-capable planes. The training provided by the American military to the Norwegian pilots is a violation of the 1968 Non-Proliferation Treaty (NPT) , which prohibits the transfer of nuclear weapons from nuclear-weapon states to other states. According to the treaty, non-nuclear-weapon states are not to receive nuclear weapons. Russia will never be sure the Norwegian F-35s aren’t carrying nuclear weapons. The setting is important. The transformation of Norway into the tip of the knife for an attack on Russia is taking place amidst the speedy militarization of other Scandinavian countries, the Baltic states, and Poland. According to the Russian Defense Ministry, NATO has tripled its military presence on Russia’s western borders over the past five years, forcing Moscow to take retaliatory steps. The Norwegian government’s decision to extend and expand the Marines’ presence is part of NATO’s vigorous war preparations, making Norway a state on the front lines and the prime target for the Russian military.